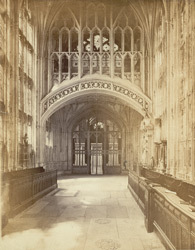 "This building is continued in a direct line with the Choir, and is entered under a fine obtuse arch richly ornamented, and separated from the passage by a very beautiful screen. The ceiling of this porch has a cross of rich pendants, surrounded by the most elaborate ribs judiciously intersected. The Chapel, at the dissolution, was said to have been one of the largest and richest in the kingdom; and tradition relates that a great part of it was then gilt and gloriously ornamented. The first object which strikes the eye on entering is the fine eastern window, adorned with painted glass of brilliant colours and representations of our Saviour, surrounded by kings, prelates, and abbots - thirty-seven in number - and varied with great effect. Behind and below the glazing of the great eastern window is a long narrow passage, built in the form of an octagon, called the 'Whispering Gallery.' If a person whispers at one side, every syllable may be distinctly heard on the other, though 25 yards distant."